Keyboarding is quickly becoming a necessary skill that children must learn, both for personal communication and educational/professional use. In the late 90's, most students only had access to keyboarding in high school typewriting classes. Now, students are learning to type as early as preschool. 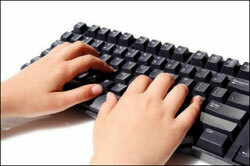 There are a variety of software programs and websites dedicated to typing, both subscription based and for free. Check out our top 5 FREE typing tutors below. 1. Dance Mat Typing - Dance Mat Typing is a colorful, interactive website that teaches children ages 7-11 to touch type. There are 4 levels divided into 3 stages; Level 1 being the easiest and gradually increasing in difficulty. In each level and stage, new animal characters will teach your child about the different rows and keys on the keyboard. After completion of each lesson, the child is rewarded with an entertaining song and dance. Dance Mat Typing also provides worksheets that teachers can use in the classroom for offline keyboarding practice. 2. E-Learning for Kids Keyboarding Skills - E-Learning for Kids Keyboarding Skills is an interactive typing tutor where your child can participate in the Type-E-Chi Virtual Typing Tournament. In this tournament, your child will earn medals and trophies as they move through the Bronze, Gold, and Silver arenas all while learning to type. The Type-E-Chi Tournament contains 10 interactive typing games that can be unlocked by moving through each of the different arenas. If your child successfully completes all of the arenas and games, they will win a certificate and become a Type-E-Chi Grandmaster! 3. Glencoe's Online Keyboarding by McGraw-Hill- Glencoe's Online Keyboarding is an online typing tutor for kids or adults that is divided into 16 individual typing lessons ranging from Home Keys and Spacebar to Symbols. Each lesson on this free typing program for kids includes a demonstration movie, typing exercises, a drill, and a printable lesson report to show completion of the lesson. This site would be great for students who need to turn in a record of their completion of a lesson. 4. PowerTyping.com - PowerTyping.com in an online typing tutor for kids or adults that includes 13 timed typing lessons for both QWERTY and DVORAK keyboards. A words-per-minute goal can be set for each lesson, and most lessons include a radio player at the bottom to encourage a rhythmic pattern while typing. 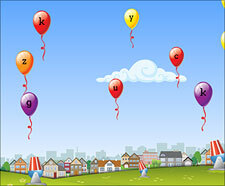 PowerTyping.com also includes a series of 5 typing games to make learning to type more exciting for children. 5. Kiran's Typing Tutor Software - Kiran's Typing Tutor is a free keyboarding program for children and adults that includes more than 500 typing lessons, practice, and tests. Each lesson calculates and shows accuracy, words-per-minute, keys-per-minute, as well as typing speed and errors for each letter. Kiran's Typing Tutor includes a module specifically for kids that include 5 lessons: Capitals, Numbers, Small Letters, Colors, and Words. 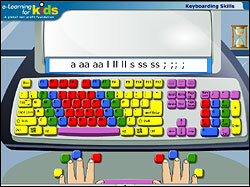 There is also a section that includes four different typing games. The program settings are customizable, and it also supports multiple users which makes this free typing program for kids ideal for the classroom. i do believe this is one of the most best typing tutor. Hi, I am Chai from Kuching, Sarawak, East Malaysia. I am looking for a good typing training package for the outback school where there is no internet access. "Dance Mat Typing" is an excellent pachage. Please advise how and where could I get (download) a EXE or ZIP standalone "Dance Mat Typing" installer, so that it can benefit those many outback kids in Sarawak. Thank you So much. this site has helped me a lot. thank you very much.